I love sitting around the dinner table with my family after a big meal and throwing dice around before everyone goes their separate ways. Playing simple yet high-risk, cheer-inducing games is a great way to build memories and have a fun, shared experience when everyone’s together. Talicor creates a lot of great family games for this purpose, one of them being the big-rig-themed KOR: Keep on Rollin’. As an automotive enthusiast, I was intrigued by this truck-themed dice game, so I bought a copy and played it with my family. Need a Second Vehicle for Your Growing Family? These models are great options! You need at least two people to play KOR: Keep on Rollin’. 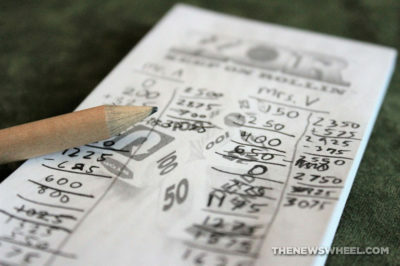 The game involves rolling dice on your turn to rack up points, with the person earning 6,000 points first being the winner. In the game, you are a trucker trying to log the most miles on your route. On a player’s turn, they roll all six dice. 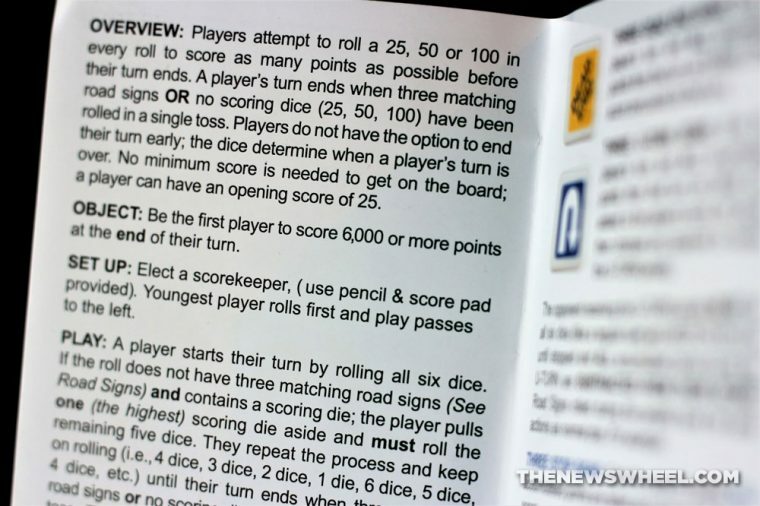 They can set aside one of the scoring die (labeled 25, 50 or 100 points) and roll the remaining die, setting aside an another scoring die each time until they don’t roll anymore scoring die, in which case they’d score their total points (if they accumulate six scoring dice, they reroll all dice and continue). 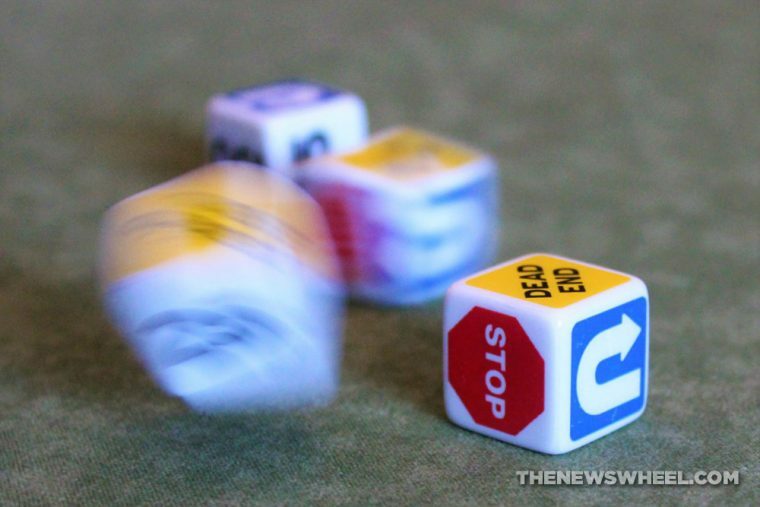 Stop Signs: Stop rolling immediately and score all accumulated dice. Dead End Signs: Stop rolling immediately and gain zero total points. Your turn ends. U-Turn Signs: Stop rolling immediately and score all accumulated dice. Then, pass the dice to any opponent, whose rolls this turn will be subtracted from their overall score, not added. The game comes in a compact little box with a cool look to it. It’s colorful and clearly advertises the big rig theme and the fact it’s a dice game. I particularly love how the semi-truck is front-and-center on the cover and the dice can be seen through the windshield. The back of the box gives a fairly detailed summary of the game so buyers know what they’re getting. Overall, KOR is well-packaged. Unfortunately, the contents don’t measure up to the same quality. In particular, the screen printing on the dice is misaligned, patchy, smeared, and rubbing off right out of the box. The watermark image on the score pad is impractical, obscuring most of what’s written in pencil on the paper. 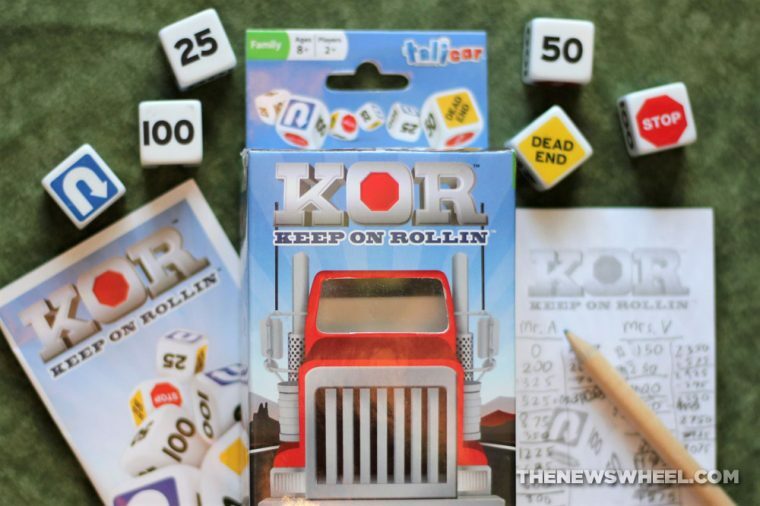 KOR: Keep on Rollin’ is a simple game that’s easy to learn thanks to its short, to-the-point instructions — making it an easy game for families of any age to learn and teach. The directions are divided into sections with headers identifying the objective, turn actions, dice symbols, and outcomes of particular rolls. The only question I had was if a score could fall below zero, but we made the house decision that it couldn’t. A lot of people I know aren’t big fans of dice games, because they’re too dependent on chance and offer players hardly any influence over the outcome of the game. I, personally, like the risk involved in them and am always interested in trying new ones to see how designers can innovate the simple act of rolling dice. The theme of KOR and its use of road signs is very clever. KOR will remind you of games like Farkle, where the goal is to roll and set aside dice to score points, hoping not to bust. KOR differs by taking away your choice to continue playing and risk losing everything or stop and keep your current score. The only way your turn ends is by rolling certain dice combinations. 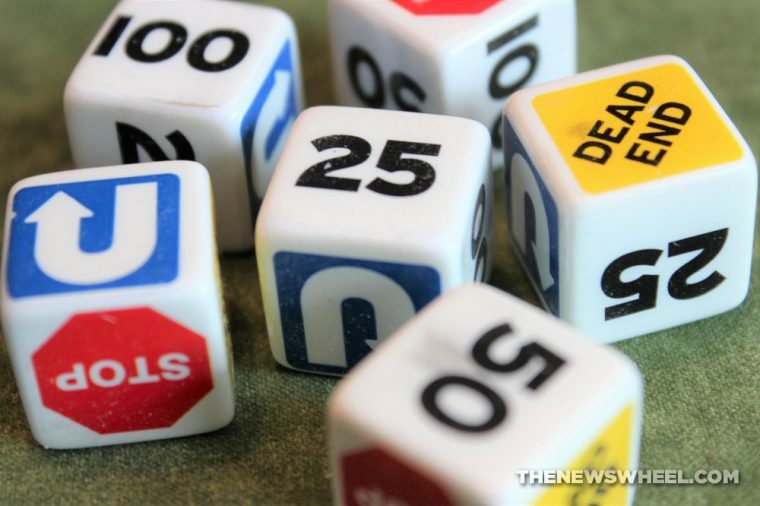 Choosing what to set aside is obvious: Whatever die has the highest value (unless you’re suffering from a U-turn, in which case it’d be lowest). Despite its unique theme and creative visual design, KOR: Keep on Rollin’ didn’t win me over. A game that doesn’t allow you to make any decisions feels like you’re at the mercy of the die entirely. You have no influence over or participation in winning or losing. 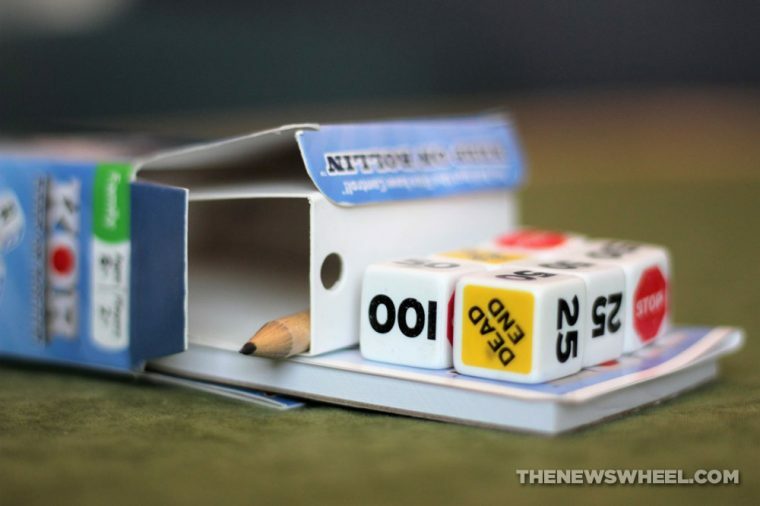 That might appeal to some families with young players who could use practice learning addition and subtraction, but the back-and-forth fluctuation of points prolongs the game longer than most people will have patience. You can purchase KOR: Keep on Rollin’ through the publisher’s website, Amazon, and other online retailers.